This buck looks great on my wall! 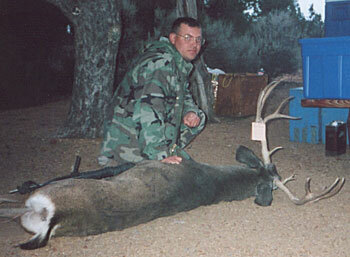 It was October 22, 2000 at approximately 1 p.m. when I took this buck. 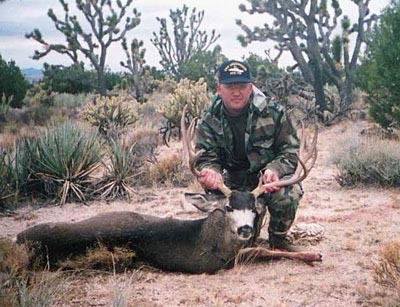 I was hunting in the Mid Hills area of the Mojave Desert in California. I was hunting with my brother-in-law when this dandy buck came out in front of me. The buck's rack measures 28 inches wide and 20 inches high. The right side has four points; the left, five points. The right eye guard has two points; the left, one. The taxidermist in the area said this is the biggest California blacktail-muley he has mounted.